A chemical reaction is the process of elements changing their structures and combining to form different byproducts and reactants. This change makes new chemical profiles when the molecules either donate or accept protons after coming into contact with one another. These reactions are the foundation of many of the interactions in nature that surround us every day. Chemical reactions are fairly easy to observe because they are usually accompanied by a very obvious physical change. This can come in the form of heat, light, the creation of gas, or the creation of a precipitate. These changes occur because with every reaction that takes place, the products must give off equal reactants. This is because matter cannot be created or destroyed. It is simply kept constant throughout all types of reactions, though it may change its profile and state of matter. Chemical reactions have been an essential part of life for as long as we have had any sort of understanding of our universe. It is these reactions that allow for life to go on. Chemical reactions are responsible for fire, cooking processes, the reduction and shaping of metal, the creation of alcohol, and many other things. As such, it soon became apparent that understanding the relationship of the world and the life that inhabits it would allow mankind to advance. Almost as soon as mankind realized the intricate balance between the elements and life, alchemy became a top interest among many scholars. Alchemy attempted to discover the connection between the properties of elements and the human spirit and experience. It was thought that understanding this connection was the key to understanding life. As a result, there were many attempts to change elements from one form to the next – the most common being to turn lead and other similar elements into gold. It was thought that if a process to turn a regular element into the most pure element (gold) could be discovered, then it would also be possible to discover a way to purify the human spirit. The problem with this, of course, is that many who ventured down the path of alchemy and attempting to understand the science at a higher level so that they could understand – and therefore manipulate – life itself. This led to many controversial studies and methodologies – though it also led to many important discoveries such as toxicology, medicine, and the foundations of modern chemistry. Although alchemy was put to rest during the Age of Enlightenment, it was a crucial step forward in determining how to understand the different systems and processes at work in the world around us. The alchemists were one of the first groups of scholars to study how elements (especially metals) interacted with one another. Many alchemists were responsible for discovering the laws that are used to understand chemistry and related sciences in modern day. Without their work, our understanding how chemical reactions occur and the relationship between elements may not have been as thorough. Although matter is never created or destroyed, there is not always a perfect ‘trade off’ when it comes to a chemical reaction. Often times, there are certain byproducts that are left over after a chemical reaction occurs. Examining these byproducts can sometimes help to determine what type of reaction is taking place. There are several different types of byproducts that can be produced from a chemical reaction. Some of the most common products are precipitates, fire, or the creation of a gas. Other byproducts that are created include new molecules that can be produced from synthesis reactions, replacement reactions, and dissociation reactions. Although some of these reactions may need to be studied before they can be identified, there are some kinds of reactions that are easily identifiable. One of the easiest chemical reactions to identify is a combustion reaction. Combustion reactions are always characterized by the fact that their products always consist of a large energy output that typically comes in the form of heat and light. There are sometimes also precipitates that are formed as a result of these types of reactions. There are many different types of chemical reactions that occur, both in nature and as a result of a man-made endeavor. These reactions take on several different forms and all have different products that are created as a result. The most common reactions to observe are synthesis reactions, single replacement reactions, double replacement reactions, decomposition reactions, and combustion reactions. How Does a Chemical Reaction Occur? There billions of elements and compounds in the universe that are comprised of atoms bound together in stable bonds. These atoms are very secure in their bonds, which means that they are relatively unlikely to undergo a chemical reaction unless they are given enough energy to overcome the stability of their bonds. This energy is known as activation energy. If elements and compounds are given enough activation energy (usually in the form of heat, pressure, etc. ), they are able to overcome the stability of their bonds and enter into a transition state. This transition state allows the atoms in a compound to break loose from their bonds and combine with new elements to form new compounds. Because there are many ways in which this activation energy can be delivered to molecules and many ways that elements are able to interact with one another, there are also many ways in which a chemical reaction can occur. A synthesis reaction (also commonly referred to as a combination reaction) is a reaction in which two or more compounds are combined together to form a new compound. In these types of reactions, there is only one end product. Synthesis reactions are one of the most common types of chemical reactions. Many essential products are made through these types of combinations. Typically, the synthesis reaction is a result of having either one cation and one anion. When the two elements are given enough activation energy to overcome their initial atomic bonds, they are able to combine with each other and help to stabilize one another with stronger bonds. The anion accepts a proton from the cation, and the two elements are able to combine to create a new compound. One example of this is salt, which is created through the union of chlorine and sodium. When these two substances are combined together, sodium donates an electron to chlorine, causing them to form a cation and anion simultaneously. When they are transformed into their ion state, their atoms are able to join together and form sodium chloride – more commonly known as salt. Single replacement reactions occur when an element reacts with a compound to form a new compound and element pairing. These reactions are created when there is enough activation energy to force a disruption between the bonds of the compound, but not enough balance between the anions and cations to create a full synthesis reaction. Instead, one element in the compound is replaced by another element. A single replacement reaction is the result of either two cations and one anion, or two anions and one cation being given enough energy to reach their transition state. When the atoms are able to move into their transition state, the molecules inside the compound (one anion and one cation) are able to free themselves from their bonds and move freely. Once they have freed themselves from their bonds, the single element is able to take the place of either ‘A’ (the anion) or ‘B’ (the cation). This creates a new compound and leaves the replaced molecule as a single element. Double replacement reactions are very similar to single replacement reactions. Instead of one element and one compound reacting however, two compounds react together and replace each other to form two new compounds. In a decomposition reaction, an element undergoes a reaction that produces two or more simpler substances. Although the substance doesn’t have to dissociate fully into an elemental state, it does have to separate into at least two different compounds. When an compound is given enough activation energy to escape its bonds, it doesn’t necessarily have to find a new element to pair with again. Instead, some of the escaped elements simply remain apart from their original compounds. This is the result of a decomposition reaction. Instead of recombining into different compounds, the elements remain separate. In bigger compounds that are comprised of more than two elements, it is also common to see a partial decomposition in which one or more elements are able to separate themselves from their original compound, but the rest of the molecule remains intact. In a combustion reaction, a compound reacts with oxygen to give off a significant amount of energy. This energy tends to manifest itself in the form of heat and light. In some cases, a precipitate like water is also produced. The following reaction shows what happens when a hydrocarbon undergoes a combustion reaction. When a hydrocarbon undergoes a combustion reaction, the products are always carbon dioxide and water. This is due to the massive release of energy that is given off when the atoms inside these bonds are able to reach transition state. A chemical reaction equation is essential for properly demonstrating how different elements interact with each other. These equations show the balance between different elements and their bonds. In order to properly write a chemical equation, there are a few rules that must be followed in order to ensure consistency. First, chemical symbols are used to properly convey which elements are reacting with one another. Secondly, in order to ensure that there is a proper conversion, the equation must be balanced. This is done to ensure that equations can be calculated properly and so the moles of each substance can be properly determined. We’ll examine the equation below to see how an improper balance of elements can affect the outcome of an equation. 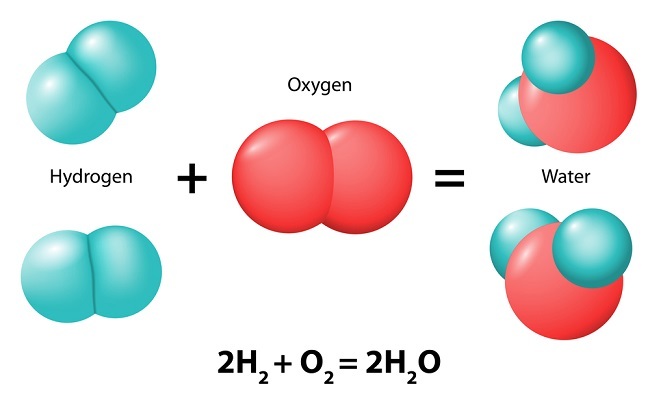 As we can see, the above equation suggests that only one of the two oxygen molecules that were present as reactants was able to be used in the production of magnesium oxide. This would suggest that one of the oxygen molecules was simply lost in the reaction. Because matter cannot be created or destroyed (simply preserved), we know that it is not possible for an oxygen atom to simply disappear in the middle of a reaction. However, we also know that magnesium cannot simply generate another atom that was not present as a reactant. In order to make this equation viable, it is necessary to balance the elements so that the quantity of the reacting atoms matches the quantity of atoms found in the products. To do this, we simply ensure that the number of magnesium molecules is equivalent to the number of oxygen molecules. By adding the 2 coefficient to the beginning magnesium molecule, we ensure that the two reactants are able to undergo a complete chemical reaction without any extra or missing molecules. Because the equation is balanced, it is now possible to calculate the moles of all the elements involved in this reaction. There are many different examples of chemical reactions that are found in modern day. Chemical reactions can be found throughout the world and are key to understanding the way life and the systems of the planet work together. These reactions can be both natural occurrences and a result of man-made endeavors. Chemical reactions are the basis of human life and occur continuously to help sustain the body. These reactions are often seen as being cyclic in nature because the byproduct of one reaction often serves as a reactant in the next reaction. As these reactions continue to combine and work together, linked series of chemical reactions form inside cells and organs begin to form. These series are known as metabolic pathways and they are responsible for helping to process and regulate the energy systems in the body. These metabolic pathways are essential for life functions. They are responsible for converting food into glucose, storing that glucose, and then using it for energy to fuel the body. It is also responsible for transporting oxygen and other nutrients throughout the body in transport systems, the formation of hair and skin cells, the creation of life through our reproductive systems, and much more. Some of the most inventive creations we’ve benefited from have been as a result of chemical reactions. This is true of both modern and ancient technology. One of the most influential discoveries of the ancient world was the creation of bronze from the synthesis of tin and copper. Discovering how to create bronze was one of the pivotal moments in human history. Up until this point, metal objects were highly coveted because pure meatal objects were either too soft to be useful or too scarce to be used by common people. The creation of bronze, however, allowed for the production of many different useful objects like tools and cooking utensils that were more durable. Chemical reactions are also the reason we are able to utilize more artistically inclined technologies like spray paint cans. These cans are able to be operated thanks in part to knowledge of ideal gas laws and knowledge of how liquified gas reacts when it is given enough activation energy to revert into its gaseous form. The pressurized liquid is given enough activation energy to revert to its gaseous state. Once it has reached its gaseous state, it seeks to escape the container so it can spread out in a more suitable environment. The result is a fast and efficient painting method that makes it easier to create art and advertising. Chemical reactions are also commonly found in nature. Not only can it be found in the process of photosynthesis that is used to nurture plants, it is also found in the creation of minerals like salt and the formation of by-products like rust. Many of these reactions occur when the elements or compounds that comprise these materials are exposed to enough activation energy to allow the molecules to break loose from their bonds. When this happens, these compounds are exposed to other elements and compounds that in turn create new by-products. In the case of salt, this reaction occurs when sodium metal is exposed to chlorine gas. The overall effect is enough to transform these elements into sodium chloride – commonly known as table salt. A similar process is responsible for the creation of rust during an oxidation reaction. Iron (when in its pure form) is extremely reactive. Whenever it is exposed to oxygen and moisture, it undergoes a chemical reaction that leaves a coat of rust on the top layer of the metal. 2. What is the energy that is required to allow chemical reactions to occur? 3. Which of the following is an example of a synthesis reaction?